One down and five to go in round one of the 21st season of Super League, and what a curtain raiser it was. Passion, power, precision and skill, and a couple of tries thrown in too. Warrington win, champions Leeds lose, but there's plenty of football to be played over the next 10 months. Boy, it's good to be back. Just time before we hop it to say a happy birthday to Harry Jepson OBE, an absolute legend of the Leeds club for today - he's 96. A gratuitous happy birthday to Brad 'Freddy' Fittler too, he's 44 on 5 February. What a player. Is Gidley the piece in the jigsaw? The 33-year-old shone in the halves with calm authority alongside the more explosive style of Chris Sandow. Playing behind a terrifically mobile yet powerful pack, the duo were able to prompt and probe and cause Leeds problems. It's only week one, but Warrington have missed that kind of leadership since the retirement of Lee Briers. Danny McGuire had arguably his most influential season in 2015 for some time, scoring tries, creating them and providing leadership. His injury will definitely have hindered Leeds' attack, the rhythm and the tempo. Liam Sutcliffe has been out for a long time and will be all the better for the run out, but needs game-time to get back to full sharpness. "They've set a high standard, both of these teams. 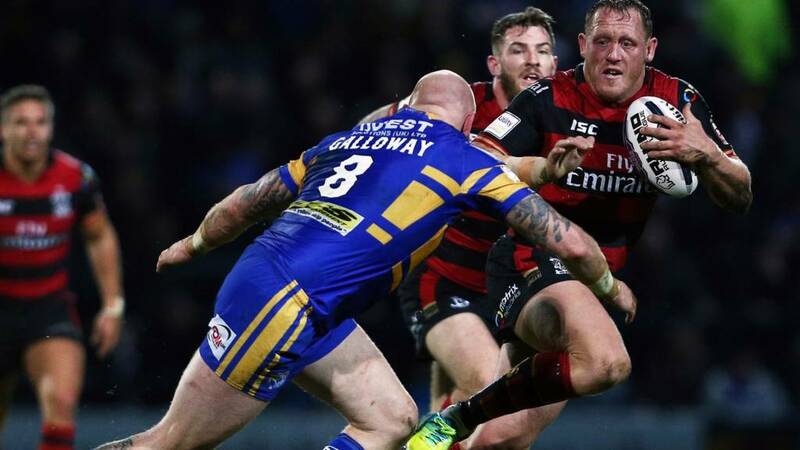 "Leeds were hindered a little with the loss of Danny McGuire, but no excuses. Warrington found enough quality in their attack and we saw some sublime touches from Sandow. "Leeds were dead and buried at one point, so the win comes down to how well Warrington defended. In the scramble moments, when Leeds thought they were getting over the line, somebody popped up with some rib-tickling tackles." The champions have been beaten. Warrington edge a fine encounter between two real contenders. Kurt Gidley had the patience, Chris Sandow the magic and the pack was immense. Leeds will be disappointed, they had chances to kick for goal but they opted to run it. But titles are not won or lost in game one. Big hands up by Jordan Lilley in the absence of Danny McGuire, while Brett Ferres was a ball of energy. Exciting, dramatic and gripping start to Super League XXI. Kallum Watkins tries to go on the outside and hits the turbos but Warrington look to force him into touch. The offload goes loose and it's all over now surely. Bar the hooter. No-one would write off Leeds though now. Zak Hardaker picks up in his own 10 and this is the last chance for Leeds. Leeds make a hash of the final tackle play, with a loose pass swallowed up 20 metres out from the Warrington line. It's one out stuff from the Wolves here, nothing daft. Agony for Leeds as Zak Hardaker is unable to find the mark, and the deficit remains two points. Time running out but the home side do have possession. Big defensive effort required by Warrington now to hold on. Leeds under pressure from Kurt Gidley's kick and Warrington are fierce in the chase and line-speed. Jordan Lilley goes for the chip 'n' chase for Leeds and wins a penalty. Zak Hardaker is going to look for the points with a goal attempt. Quote Message: How did Rob Burrow not score?! What pace has Ben Currie got?! That's a try-saving tackle. How did Rob Burrow not score?! What pace has Ben Currie got?! That's a try-saving tackle. Rob Burrow ALMOST got away to score but he didn't back his pace and he was scragged by the Warrington cover Ben Currie. Leeds try to go right but the ball was forward from Kallum Watkins to Tom Briscoe and play is brought back. Leeds trail then as we move inside the final 10. Will there be a dramatic finale? Quote Message: Fabulous Warrington try. It's a precision kick and a half from Sandow. Fabulous Warrington try. It's a precision kick and a half from Sandow. Warrington work it down the right through Matty Russell, Tom Lineham and Rhys Evans, with the latter eventually stopped. However the ball is worked to Chris Sandow, who measures a perfect kick to Ben Currie and in goes Kevin Penny for a score. Kurt Gidley knocks it over, two point ball-game! Credit to Kurt Gidley. Both Brad Singleton and Keith Galloway have lined him up for almost every drive but he's holding his own. Leeds peg Warrington back in their own half with a kick from Jordan Lilley. It's eating up the clock and eating up the energy. Warrington put on the move to the right but Rob Burrow comes in with superb technique to drive Rhys Evans into touch. Brilliant defence from the little pivot. Beautiful move through hands down the left and Leeds centre Joel Moon is displaying some cutting running lines at the moment. Leeds again turnover on the last but Warrington are having to come away from their own line.